Abraham and Isaac were to become two of the cornerstone personalities of Israel. The opening verses of Genesis 21 portray the birth of Isaac. Twice in the opening verse is it emphasized that God had returned to fulfill His promise to Abraham and Sarah. God had promised them a child, and He proved faithful once again. "And the Lord visited Sarah as he had said, and the Lord did unto Sarah as he had spoken." God had miraculously restored the ability of Abram and Sarah to have children. At the birth of Isaac Abram was 100 years old and Sarah was 90. Their elderly bodies were revitalized, able to perform functions that normal 90+ year old humans are unable to perform. Verse 7 even makes mention of Sarah's ability to nurse her newborn son from her breast. This is quite a remarkable detail provided, and suggests a complete restoration of Sarah's body and abilities. 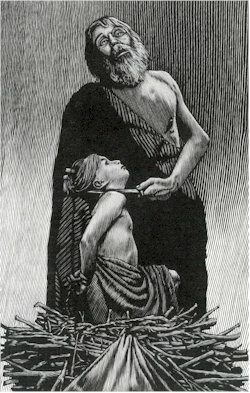 Despite the age difference in father-son, Abraham and Isaac would become close over the course of their lives. This, of course, would be a miracle today and was in antiquity as well. Some Biblical historians and scholars claim nearly 300 years had passed since the flood, over which lifespans had significantly reduced themselves nearly to what they are today. This makes God's miracle all the more miraculous, as Abram would go on to father six more children with Keturah, his second wife after Sarah dies. The name of Abraham's son Isaac literally means "laughter". When Isaac was 8 days old, according to the custom God put in place with Abraham, he circumcised his son. Scripture indicates that Isaac was raised in accordance to God's commands. He was nursed (v. 7) the proper time, probably until he was two or three. Abraham and Isaac would have certainly worshiped God together. Abraham would raise Isaac in the statutes of God Almighty. A great feast was thrown on the day he was weaned (v. 8), again in agreement with custom. It was at the feast that Sarah accused Ishmael of mocking Isaac. With the birth of Isaac, Hagar and Ishmael seem to have disappeared. Naturally, resentment would have arisen between the camps of Ishmael and Isaac, with Abram caught in the middle. Some scholars say Ishmael was 16 years old when he mocked the 3 year old Isaac. Abraham and Isaac were to be the ancestors of God's promised seed. Ishmael, too, was blessed by God. However, it became apparent that the two parties could not live with each other. Sarah's words appear overly harsh and bitter in verse 10. She makes it clear that she will have no part of Isaac and Ishmael co-existing. "Wherefore she said unto Abraham, Cast out this bondwoman and her son; for the son of this bondwoman shall not be heir with my son, even with Isaac." One senses his despair when his wife demands such. He loved Ishmael as his own son, though not the promised son, his blessed son nonetheless. The account in Genesis states; "the thing was very grievous in Abraham's sight because of his son." 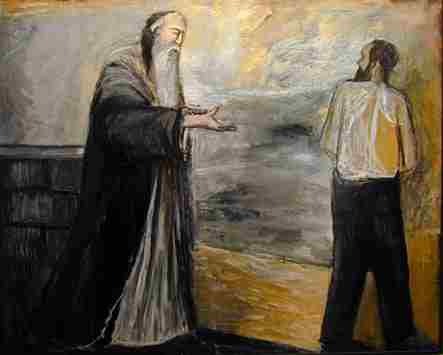 However, God reassures Abraham that He will take care of Ishmael. As is typical of God, He takes a bad situation, and works it for His glory. Ishmael would become the father of a nation as well. "And also of the son of the bondwoman will I make a nation, because he is thy seed." Meager preparations appear to be made for the departure of Hagar and Ishmael. Abraham simply gave Hagar and Ishmael bread and a bottle of water. This certainly appears cruel and harsh. Though God would provide for the needs of the two, it seems only proper Abraham would've given them more for the journey. Either Sarah prevented such, or Abraham felt they had all they needed with God's protection. In reality, it is a tremendous sign of the faith Abram had developed in God over the years. God had proven time and again that His word was enough. He had given Abraham His word concerning Ishmael, and Abraham was satisfied. Hagar and Ishmael appear to set out for Egypt, Hagar's homeland. They set out initially in the direction of Beer-sheba. Archaeology has revealed that there were many settlements within this region. Scripture says she "wandered in the wilderness of Beer-sheba". Hagar apparently lost her way, and then the water ran out. At this point, her son is near death and cannot continue to wander any longer. She places him under a bush for shade, and awaits his and her death. As they both cry out to God, "the angel of God called out to Hagar out of Heaven". In that instant, Hagar and her son were saved. This was the same angel of God that had delivered Hagar years earlier, before the birth of her son, when she alone was in the desert near death. She had fled Sarah, too, in this incident. Hagar chose to remain there, in the wilderness of Paran, where God had provided for them. Ishmael became an archer, married an Egyptian woman, obtained by Hagar from her people, and eventually had twelve sons, as God had promised. Abraham and Isaac, however, continued to thrive in Canaan. As father and son, Abraham would have taught Isaac to run a household. Abraham would have introduced Isaac to the prominent men in the area. He would have prepared Isaac to become a man, and to inherit the large estate at his death. In all likelihood, Abraham and Isaac were inseparable. SHARE YOUR THOUGHTS. What are your thoughts concerning Isaac's miraculous birth? Give us your insights into the life of Abraham and Isaac! Genesis 24 is the longest chapter in the book of Genesis. Abraham and Isaac are recovering from the death of Sarah, in Genesis 23. They are both living in Mamre, near the cave of Machpelah where Sarah was buried. "Now Abraham was old, advanced in age; and the Lord had blessed Abraham in every way." We learn in Genesis 25:40 that Isaac is 40 years old at this point in the narrative. This would make Abraham 140 years old. Indeed, he was getting up in his years. Abraham was surely taking inventory of his life and household in his later years. With the death of Sarah, the household was solely in the hands of Abraham and Isaac. It was up to these two to continue God's work in Canaan. Abraham realized one glaring element which was missing; a bride for Isaac. In verse 2, Abraham approaches "his servant, the oldest of his household, who had taken charge of all that he owned" and asks the servant to place his hand under Abraham's thigh. It is interesting to take a step back, and read the verse. Abraham had placed all of his household under the charge of one servant. This servant unquestionably had all of Abraham's trust. Every good leader must have good men under him, and Abraham demonstrates the trust he has in the competence of his servant. Leaders often fail because of the men in their charge. Abraham, however, without a doubt sought God's guidance on the men he placed under him. Abraham and Isaac had dwelt in the land of Canaan throughout their lives. Isaac, according to Scripture, appears to have never left Canaan. "by the Lord, the God of heaven and the God of earth, that you shall not take a wife for my son from the daughers fo the Canaanites..."
If Eliezar was still living at this time, he was the servant in this passage. However, this cannot be verified, for Scripture never relates the servants name. At this point in Genesis it had been fifty years since Eliezar's name was mentioned. It is possible he may not have been alive. In any regards, the servant was not traveling in his name, but in the name of Isaac, the son of Abraham. The gesture of placing his hand under Abraham's thigh is an interesting one. Though the exact meaning is not fully known, all the Jewish scholars of antiquity understood this to be symbolic of placing one's hand under the male genitalia. This symbolized the act of circumcision. It signified a most solemn oath between two people. 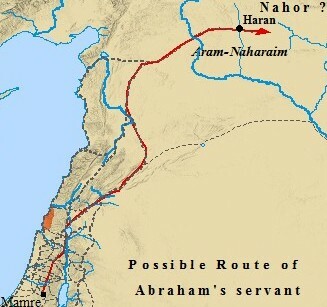 Abraham instructs his servant to journey to the land of Abraham's father, in Aram-Naharaim in Mesopotamia . It is there, from his father's household, a bride must be found for Isaac. Before the servant departs, he asked Abraham if he was unable to find a wife, should he bring Isaac to Naor. Abraham answered no, for Isaac was to dwell in Canaan, and further the work of Abraham. The servant accepts his task, and sets out for Mesopotamia with ten camels of Abraham's. His destination is "unto the city of Nahor". The city of Nahor was located in Aram-Naharaim. Many scholars have claimed it was another name for the city of Haran. However, this does not agree with Scripture. It is generally believed Nahor was a neighboring city of Haran. It was close enough to Haran to allow the citizens of each city to travel easily back and forth. The journey from Mamre to Nahor would have been approximately a five hundred mile trek. The entire journey is skipped over in silence in the Genesis narrative. 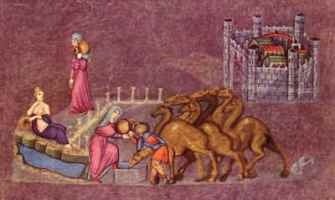 Upon arrival in Nahor, the servant stops at the well outside of the city. 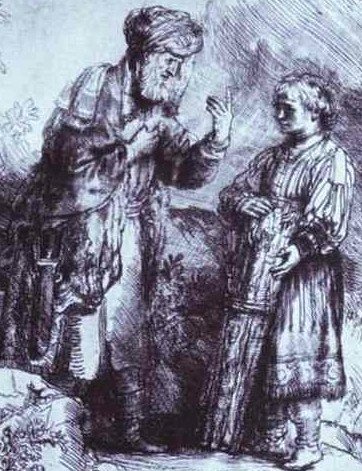 The servant prays to God that a sign may be given him in regards to Isaac's wife. He asks God to bring forth a woman who will oblige him a drink from the well, and then voluntarily water the camels as well. The servant is no sooner done praying, that a woman walks up to the well. This woman is Rebekah, and is to be the future wife of Isaac. The servant is ushered to the house of Rebekah. Rebekah's line of descent is as follows. She was the daughter of Bethuel. Bethuel was the son of Milcah. If one remembers, Milcah is the wife of Nahor, Abraham's brother. Milcah was in the initial travel part out of Ur. She chose to settle in Aram - Naharaim with Terah , and her husband. This would place Rebekah as the niece of Abraham, and Isaac's cousin. Thus, the servant had successfully secured a bride for Isaac from the household of Abraham's father. The servant makes the necessary introductions to Rebekah's family, and assures them he was sent by Abraham. Rebekah's family grants their daughter to the servant, and with no delay, they set out at once for Mamre. Interestingly, the servant appears to have spent only one night, before taking to the road once again. Abraham and Isaac were no doubt anxiously waiting his return. Thus, he wasted no time. Upon arrival in Mamre, Isaac sees his wife from a distance, and rushes to meet her. Scripture then relates he took her to his mother Sarah's tent. Abraham and Isaac had another female in the household now. Scripture points out Isaac found much comfort in his new wife. Genesis 24 ends with Isaac taking Rebekah as his wife. He "loved her: and Isaac was comforted after his mother's death." Abraham and Isaac had both suffered great loss and experienced much pain with the death of Sarah. Isaac, now, had a wife and a family of his own. Abraham and Isaac were set to further God's work in Canaan. Together, with Rebekah, they would continue for the next 35 years, until the death of Abraham. At that point, Isaac and Rebekah took over the narrative. It was through these two Israel would spring forth. Abraham and Isaac had grown close as father and son. He had raised Isaac in the ways of the Lord. Now, Abraham had to release his son into the hands of God. Isaac and Rebekah would take up the reigns now. It would be up to them to continue the work of Abraham and Sarah. Watchman Nee takes the lives of Abraham, Isaac, and Jacob and applies their struggles and triumphs to the Christian walk. The Christian life is based on the irreversible promises God made to these early patriarchs. 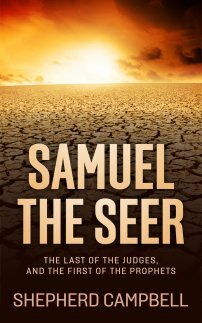 Click on the link below to visit www.betterworldbooks.com and view The God of Abraham, Isaac, and Jacob! Orson Scott Card, author of Sarah, continues his Women in Genesis series with Rebekah, Women of Genesis series 2. Rebekah left her father's house to follow Isaac to Canaan. Rebekah is pictured as an intelligent, independent woman who speaks her mind, even to Abraham. This book, provided by barnesandnoble.com, sheds invaluable light on the role of women in the Bible and early Christianity. Click on the link below to visit bn.com and obtain your copy of Rebekah! The links below give more information on the story and background of Abraham and Isaac; as well as other related topics. Explore the lands of the Old Testament! 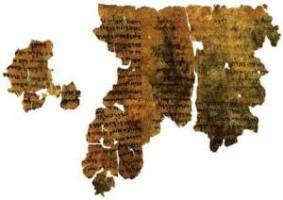 View these Old Testament Bible Maps!